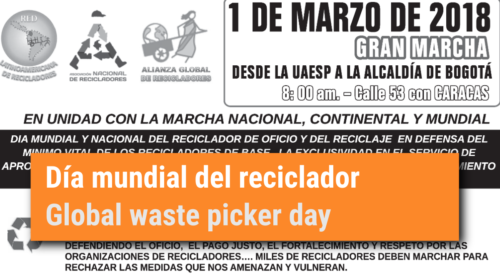 It is with great pleasure that we are sharing with all the recycling community and allies the differents campaigns and demonstrations taking place today march 1st, international waste-pickers day. No borders for those who fight! 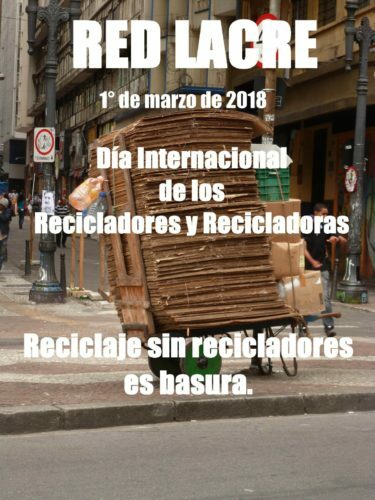 Help us spread the message using #DiadelReciclador and #WastePickersDay in Twitter and Facebook. The National Wastepicker Association (ANR) has prepared a huge demonstration in Bogota for this March 1st. Meeting point is at Street 53 with Caracas, Bogotá at 8 am. Read full statement (in Spanish). Paris waste pickers have called to march for the Global Waste Picker Day this March 1 at 2:00 pm in Ménilmontant, Paris 11eme. You can read the letter they have written with their demands to the Mayor of Paris. More on Amelior´s website. The Planeta Verde Cooperative from Rionegro, Colombia shares their struggle. They are facing persecution from the municipal administration. Read their statement or follow on Facebook how the fight evolves. En Bucaramanga empezó ayer 28 de febrero la transferencia de pago a las organizaciones de recicladores, aun no se ha hecho “oficial” el pago. Tras meses de negociaciones infructuosas finalmente las dos organizaciones de recicladores de la ciudad están materializando su condicion de prestadores del servicio de aprovechamieto de residuos mediante un pago. 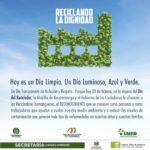 Ello se oficializó para conmemorar desde el municipio el día del reciclador. In the Argentine Republic there are more than 100,000 waste pickers (cartoneros, carreros and recicladores) who, every day, recover thousands of tons of waste, reducing the environmental impact and generating a better world. However, we are still struggling for the full recognition of our rights as workers. Recycling is not a crime. Read the full statement (in Spanish). 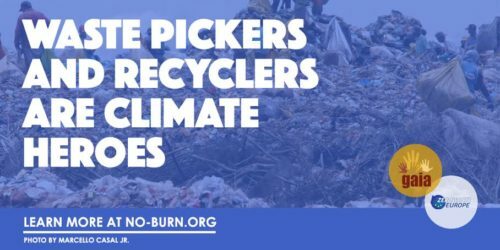 South Africa: for a Recycling Revolution: Don’t burn our livelihoods! As the South African Waste Pickers Association we are fighting for a Recycling Revolution! Don’t burn our livelihoods: Recycle, Reuse, Reduce. This livelihood helps us to put food on the table and take our children to school. More than 60 000 waste pickers make a living by collecting recyclable material on the streets and on landfill sites. Read full statement. Dakar, Senegal: Another massive fire in Mbeubeuss landfill, show support! On Sunday the 11th of February 2018 a massive fire broke out at the Mbeubeuss waste dump in Dakar, Senegal. According to recent estimates, there are 2,500 waste pickers who earn their living recuperating recyclable materials from the dump. Some of these waste pickers lost years of storage, raw material, and shelter in the fire. A GoFund me campaign has been established to support the waste pickers at Mbeubeuss. Show your support here. Support and Donate! See full post: Another massive fire in Mbeubeuss landfill in Dakar, show support! On the Global Waste Picker Day, leaders of the second-degree cooperative Redesol (Belo Horizonte, Brazil) Ivaneide da Silva Souza (video) and Cleide Maria (video) send their message to the world about the importance of this work as environmental agent carried out by these workers. If we do not understand waste as part of our environment, how are we going to recover them? Waste is the leftovers or the discard of the transformation of nature into our livelihood. Everything, absolutely everything, comes from this process that was once natural, now transformed. If we do not treat, reuse and recycle, these previously natural wastes will only harm nature. Who wins and who loses because of this mindset? Who wins and who loses by discarding our waste in this way? What can we do, individually or collectively?! Act now, nature is worth being defended, cared for and preserved. A hug for you who thinks and makes revolution! Read the news by Gaia Africa about the landslide in Hulene Landfilll near Maputo last february 19th. The Network Rete ONU (National Network of Operators of the used things in Italy) wants to join collectors from around the world in the celebration of the International Day of Recicladores de base of the first of March (pending publication). Read full article by Hasiru Dala. You can find Campaign material at RedLacre Facebook page. Gaia, the Global Alliance for Incineration Alternatives also launches a support campaign for waste pickers.